Drawing of Galileo's wooden pendulum clock. Public domain in the United States. One day I will find the time and the money to sit down and make my own wooden clock. Until then, I've done all the research needed, figured out what tools to use, and learned about the different parts of a wooden clock. Here, I'll share what I've learned. The tools required to make a wooden-gear clock. How to build a clock, with visual aids and a video. 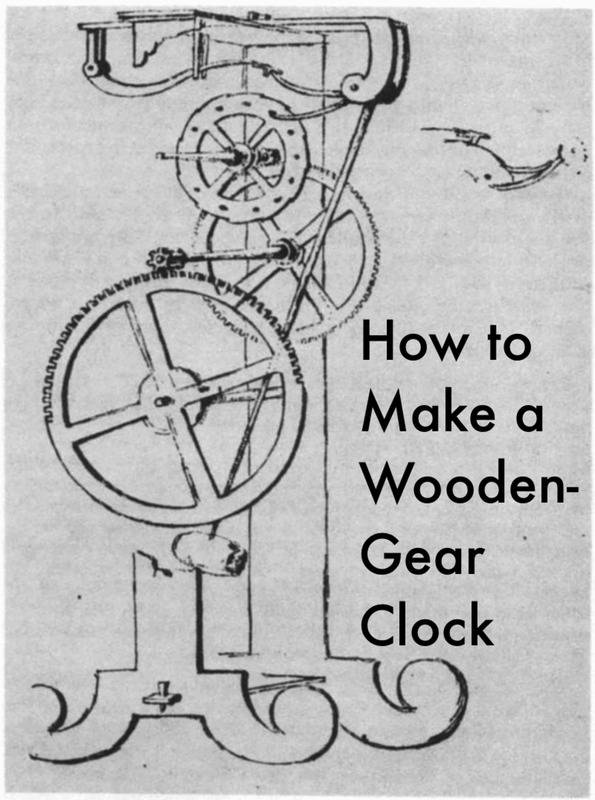 This article is about making a wooden-gear clock from a plan purchased online. The most popular plans are Clayton Boyer clocks. Building a wooden-gear clock entirely from scratch requires mechanical and mathematical knowledge that's beyond the scope of this article. How do Wooden-Gear Clocks Work? The process of making a clock work just right is a little tricky and it will take some trial and error to make it keep time, but that is part of the fun of the project. Learning as much as you can about how clocks work is the first step to building your own. You may want to take a moment to flip through some books on the subject. You can either buy books from Amazon or your local book store, or you can do what I did and go to your local library and check out some of the books they have have on clock repair. Clocks have been around for several centuries, so there is plenty of information on the art of clockwork and its history, which I really enjoy learning about. You can also spend some time on YouTube and watch everything possible about clocks and how they work. You will be amazed at the amount of information available on some of these websites. I know I was. Power source: What keeps the clock going? 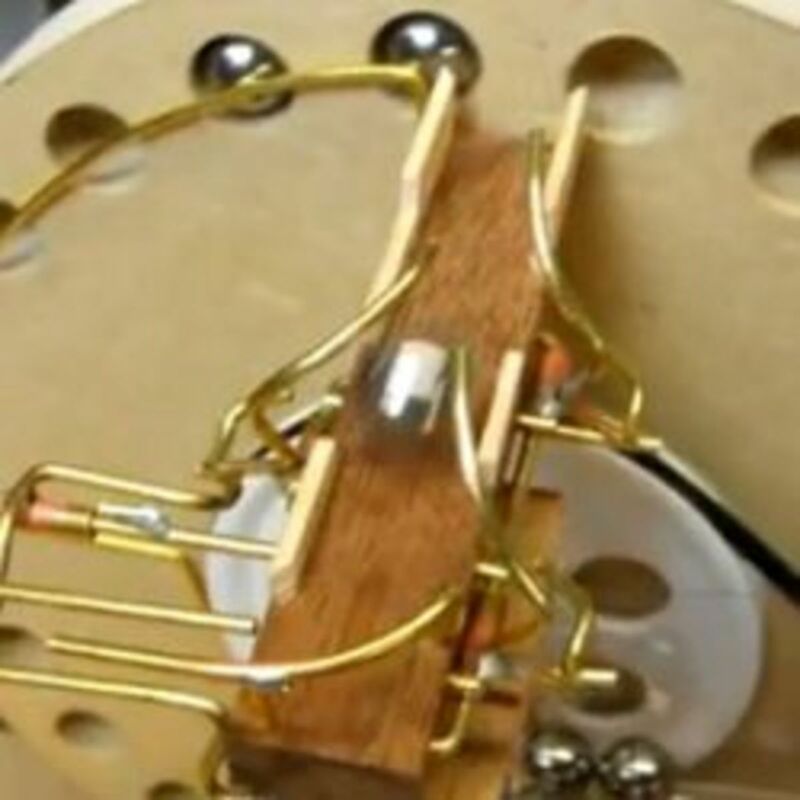 In the case of most homemade clocks, the momentum is created by a swinging weight, or pendulum, which moves the gears as it swings back and forth. Escapement: A device that controls the energy that escapes from the movement of the weight, slowing it down and allowing the energy to be spaced out over time. The escapement is built out of an escape gear, escape lever, and the pendulum. As the pendulum swings, it moves the escapement lever in and out of the escape gear, stopping it from spinning. The escapement is what makes the tick-tock sound. Gear train: When mounted on the frame, the gears for the second, minute, and hour hands interlock and roll on each other. This mechanism is called the gear train. The different gears are explained in detail below. Gear: Clock gears are actually made of four parts: the wheel, the arbor, the pinion, and the pivot. The wheel is the toothed circle that turns, hooking the other wheels with its teeth. The arbor is the axel of the gear. The pinion is a small wheel held to the main wheel by the arbor, which is driven by the other gears. The pivot is a tube of polished metal at the end of the arbor which reduces friction with the plate. The three gears of a clock. As shown above, roughly, a clock usually has three gears in its gear train, each moving one of the three hands indicating seconds, minutes, and hours. 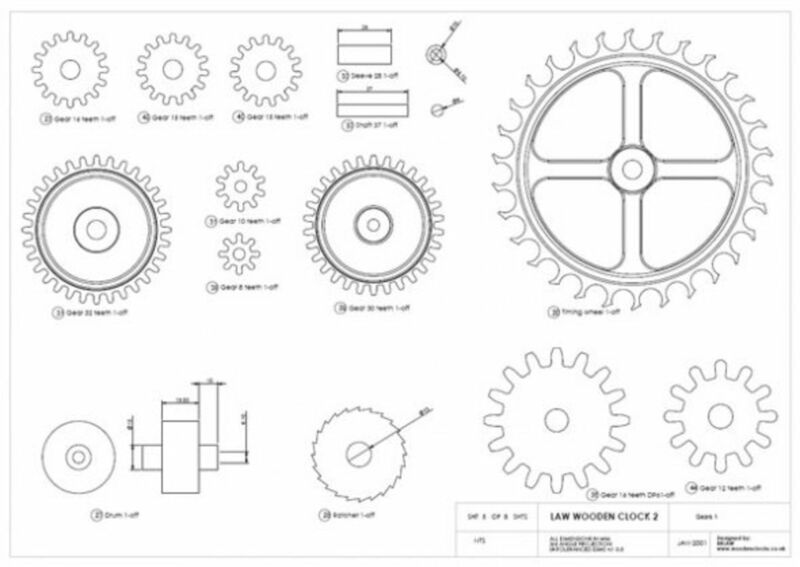 Gear diagram of a wooden clock. The rough diagram above shows how the gears of a wooden clock interlock and move to keep time. 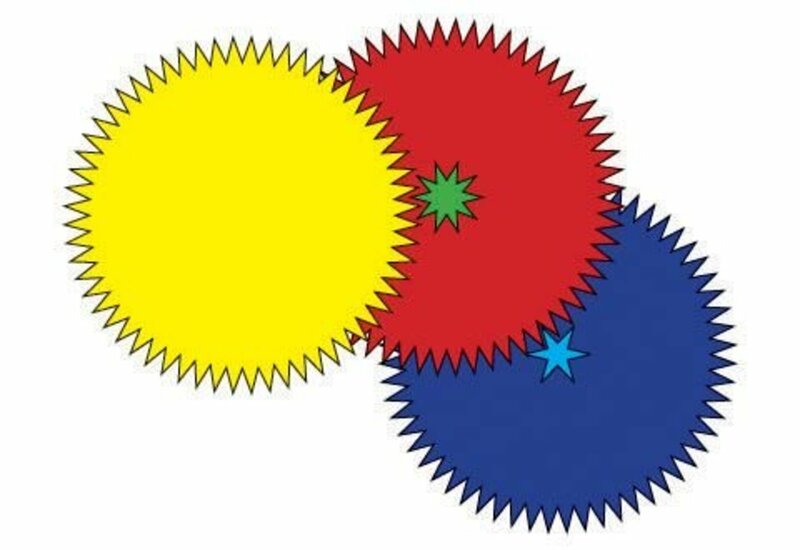 The yellow, red, and dark blue gears aren't connected to each other, rather they interlock with each others' pinions (the green and light blue wheels), which are affixed to the main gear wheels. This changes the speed by which the driving gear moves the next and is determined by the size and teeth number of the pinion. In the diagram above, every time the yellow gear turns one full rotation around its sixty teeth, the red gear turns a total of six rotations. The yellow gear is pushing the green pinion, making the red wheel, also with sixty gears, move faster than the yellow one. Every time the red gear turns one full rotation, the blue gear turns ten times. The gears on a wooden clock will operate under the same principles, and allow the second hand to run faster than the minute hand, which will run faster than the hour hand. Most amateur clockmakers—also known as horologists—will want to make their wooden clock from a plan. There are many places online to purchase patterns, but the most popular seems to be Clayton Boyer clocks, and many of the YouTube tutorials about wooden clockmaking concern Clayton Boyer plans. You can also purchase books and kits from Amazon. Because of the precision required in cutting and sanding the teeth of the gears, escapement wheel, and other parts, making even a simple wooden clock demands access to power tools and a woodshop. Safety gear: goggles, work gloves, sturdy shoes, and a thick apron. You may be asking, what is the best kind of wood to use for a wooden-gear clock? There is no single answer, but you want to use a wood that is hard and strong enough not to split, and fine-grained for smoothness and detailing. 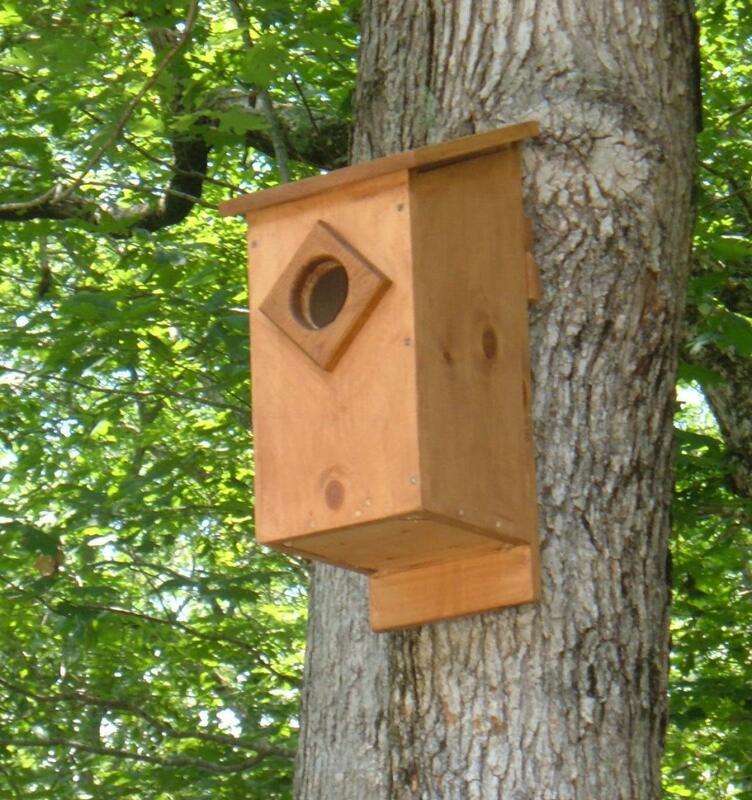 You don't need fancy exotic wood, a good birch plywood, maple, or oak should suffice. Make copies of your plans in case you mess up and need to start over. Cut out each part from the plan. Using a spray adhesive, carefully glue your plans to the wood, taking care there are no air bubbles. Cut out the rough shape of the individual parts, which will make them easier to cut precisely with the scroll or band saw. In most wooden-gear clock plans, you need to drill holes where the arbor will slip through the gear. There will often be a set of holes in between the gear teeth and in the interior cut-outs of the gears. These holes make it easier to cut out the teeth and cut-outs by inserting the scroll saw into them and using them as a starting point. Using a scroll saw, cut out the gears and their teeth. Some woodworkers prefer to use a band saw for this step. Whatever you use, be extremely careful and take your time. The precision of the gear teeth is one key to making your clock keep time. Sand everything. Using a dremel or power sander, sand every cut edge of the gears as perfectly as possible. You could just leave your clock in it's raw wood state, and it may look lovely. 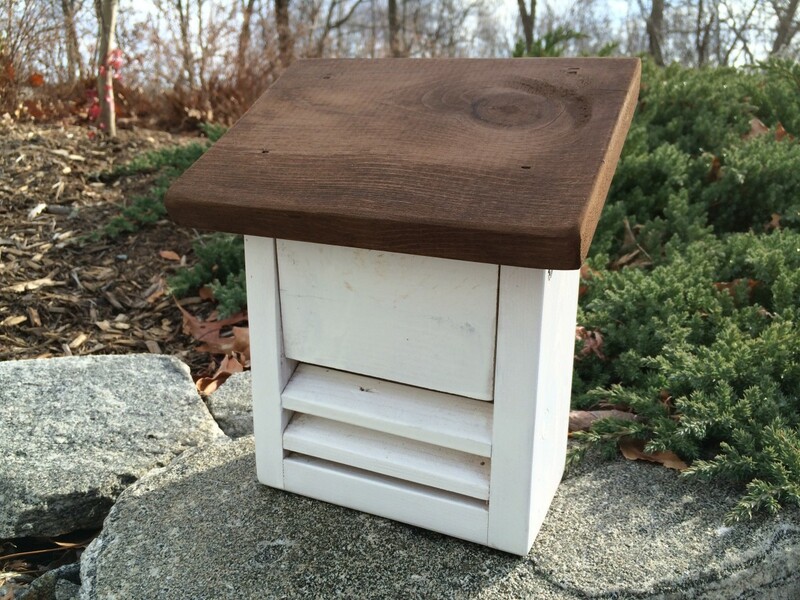 However, staining it will make it look more professional and sealing with protect the wood for years to come. 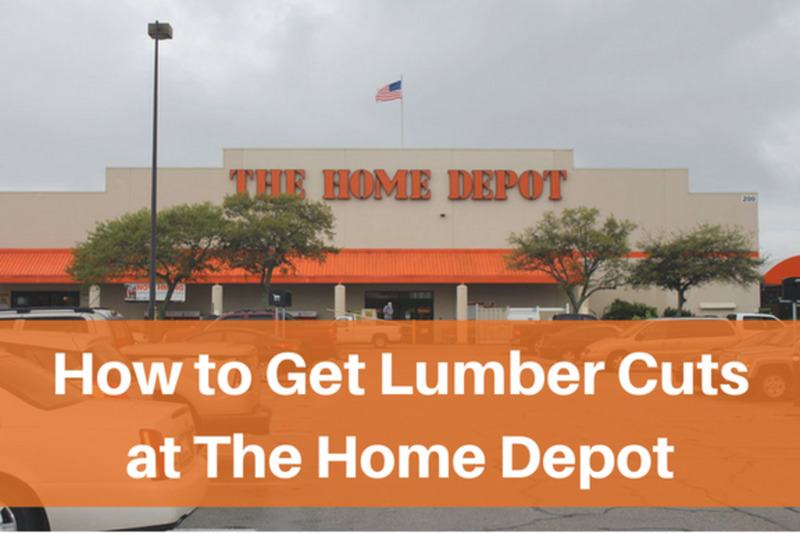 Make sure you follow the directions for your wood stain. If you don't apply it evenly or wipe it off when the directions say to, you may get blotches and streaks. What you want is a nice uniform color all over the wood. Avoid staining or varnishing the insides of the teeth, which could mess up your gear train. Think about staining the gears different colors. This will give the moving gears some added visual interest, and contrast the different parts of the clock from each other. As discussed above, the gear wheels are made up of the wheel itself, a pinion, and an axel or arbor. Most wooden clockmaking kits will come with a sheet of paper laying out the arbors and pivots. Use this to determine the size of the rods. Use a polisher and sander to clean and polish the rods. This will reduce the amount of friction they cause. Following your clock plan's instructions, assemble the wheels, pinions, and spacers using the arbors. Use wood glue and clamps to affix the pinion and spacers to the wheels around the arbors. How you assemble your clock will, for the most part, depend on what type of clock you're building and from what plan. Build the frame using your plan's instructions. Every frame will be different, and some are more ornate than others. The frame will have holes to house the wheel sets' arbors. Insert each wheel set (the gear wheel, pinion, arbor, and possibly a spacer) and the escapement mechanism into the frame, first one at a time and then two at a time, to make sure they run freely and with each other. You should be able to make the wheels move freely just by blowing on them. You may find that some of your parts do not fit very well together. That may be because of the stain and the sealer. All it takes is a bit of sanding where the joint fits and you should be back in business. The pendulum and drive weight, along with the escape mechanism, are what actually make your clock keep time. Again, the specifications here will depend on what your instructions say to do. Generally, you will make the drive weight using wood and lead shot. Add the hands and any other decorative elements. Make sure the escapement mechanism is ticking at an even speed, and if not, manually adjusting the anchor should do the trick. Make your drive weight is adjustable. 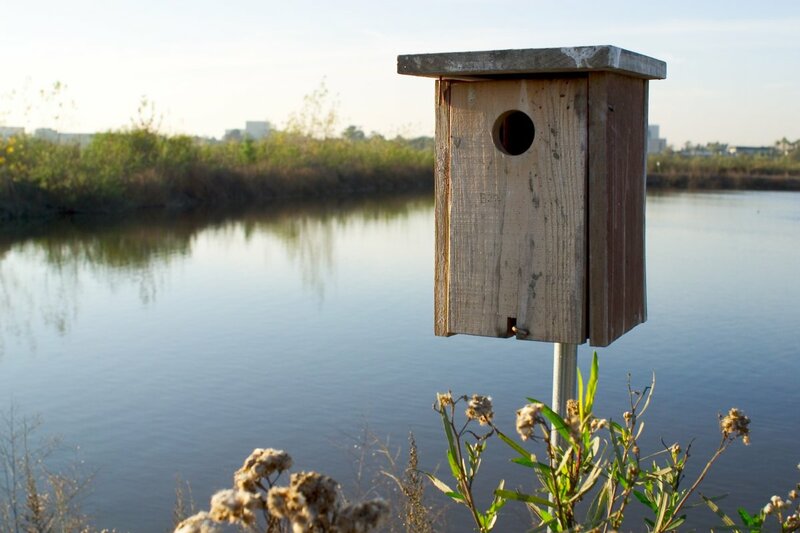 You can do this by weighting it with lead shot which can be easily added or removed. If the clock is running slow, the weight is probably too heavy, and too little weight can stop the clock altogether. Check the pendulum bob, which should also be made adjustable. If the clock is running fast, slide the bob down the pendulum, and up if it's running slow. Unlike metal clocks, wooden-gear clocks need very little cosmetic upkeep or oiling. Since most wooden-gear clocks are exposed, treating the wood with oil will just attract dirt and dust into the clock and gum up the moving parts. Instead of using oil, use a dust rag, fine steel wool, or sand paper to wipe dust and debris. If it's extremely dirty, wash it with an old toothbrush and warm water and clean out any exposed holes with a toothpick. If you must, use a small amount of graphite grease on the pivot only. Of all the moving parts, the escapement wheel will wear out the fastest. You might even want to make an extra wheel for replacement. 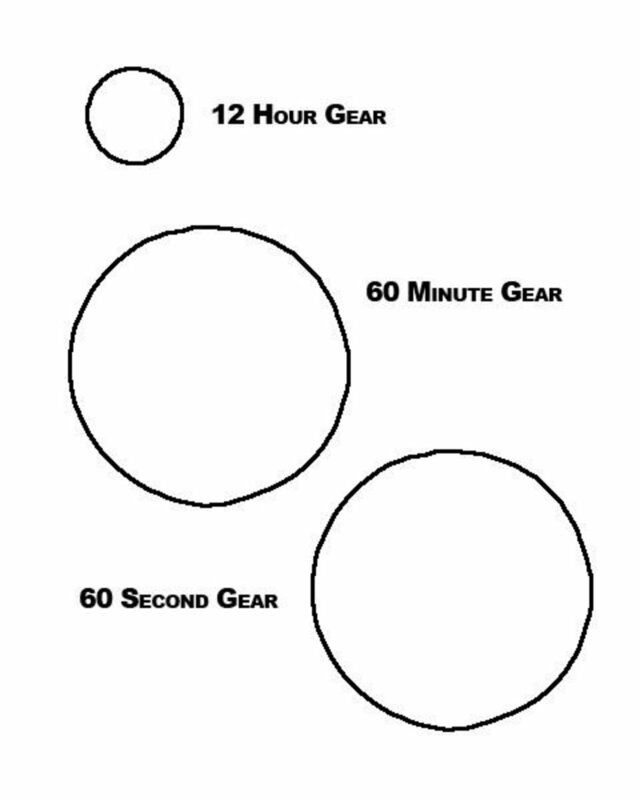 "Gear ratio" denotes the ratio of the speed of one gear (the input gear) to the speed of the second, or output, gear. Not just clocks, but motors, pulley systems, and other simple and complex machines are built to optimize gear ratios. If you make a wooden-gear clock from a plan, the gear ratio will have been figured out for you by whoever drew up the plan. The number of teeth on the wheels and the pinions has been optimized so that the hour, minute, and second hands move at different speeds, but on the same rhythm, all synchronized to the tick tock of the escapement wheel. However, if you want to build a clock from scratch, you'll need to optimize the gear ratio yourself. The escapement gear, pushing the pendulum, counts the seconds, and there are 60 seconds in a minute, and 60 minutes in an hour, or 3,600 seconds in an hour. The minute hand gear, therefore, should rotate once every 3,600 seconds. The axle indicating hours will rotate once every 43,200 seconds (or every 12 hours). Wooden Gear Clock: Gear Train. Includes calculations and a spreadsheet for carving wheels and pinions from scratch. Gary's Wooden Clock: Clock Gear Math. 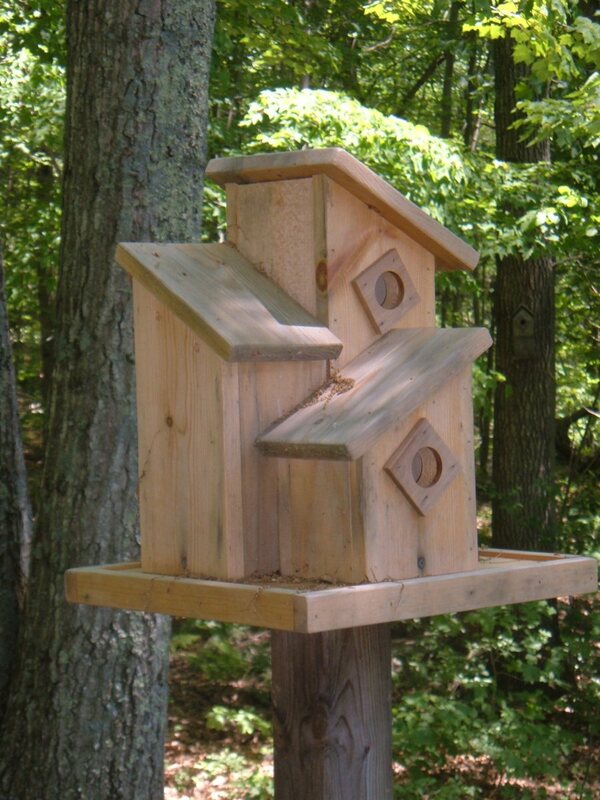 wow this is intricate, thanks for sharing Robert don't think im that skilled yet, all im building are some project from this online plans bundle https://tinyurl.com/y9ydf3sa and just learning through trial and error. well it's certainly a pretty complex process, but making your very own (and fully functional) wooden clock must be highly rewarding... Also, thanks for the extremely comprehensive post! Great lens! Thanks for the info and the plans. Didn't realize you should to re-treat the wood so much, and like the point about the escapement mechanism wearing out (sometimes the obvious needs a big shiny arrow pointing at it - or maybe just a tentacle). i would love to make a car that was like a clock its all weights and makes gasoline not worth the use and would be like we need really good breaks. i would be like this car is really light and has little maintenance. Very nice lens! I've always been fascinated by clocks. Thanks for this great lens. I've always been intrigued by clocks and gears, and maybe I'll give this a try! Wow...awesome lens, I need a scroll saw now that I have room for it. This is a wonderful lens; very informative and interesting. @bluelily lm: I have also been thinking about a CNC machine where I can let the computer burn them for me out of plywood. @ChronosR: Thank you for the explanation. Like I said, these gear ratios are difficult. Wonderful, I rarely see such comprehensive guides. Wow, this is such a cool idea, thanks for all of the details, I know a few people I'll have to refer to this site who would love to try this sometime. Thanks again! I am horrible at making stuff out of wood, but my husband will love this! Thanks! I never knew "time" could be so well-represented in so many different ways. I'll have to visit this lens again when I have more time and absorb some more of your wisdom. Well done! This is a really cool Lens. I had fun. The idea of building a wooden clock is appealing although I doubt I would ever have the patience to do so. Awesome work on this lens. Great detail. I like wooden gears they look so beautiful. Good lens! Now this is great lens . Very interesting lens - fantastic workmanship in these time pieces. This was a very interesting and informative clock lens, rgasperson! It will make an interesting project to create one's own wooden clock. Using 3D Printer can simplify the process for making wooden gear easily but it will a bit costly affair. So many different clocks! This is so interesting. I can see you put a lot of effort into this. Great Job Mate! They are cool! Where would we be without time? Nice lens! I just wish I had the time! Fascinating stuff, roll on retirement! Terrific idea . . . I never would have thought about building a totally wooded clock . . . gears and all. This is definitely one of the more unique and invoived how to's I've seen here. A great lens!! Great Idea! I just lowe wood, and this len open up a whole new perspective! I'd love to be able to have the talent to do something like this. I don't even have a scroll saw (yet). I am a sort of woodworker and these look hard. What a fantastic lens! The amount of detail you've gone into is incredible! a wooden gear clock...now that is interesting. Very interesting project. Great conversation piece. What a cool project! I would have expected the insides of a clock to be a lot more complicated but the way you've presented this makes it seem quite do-able. @HairBowHanna: What. You don't want to take on the project Yourself? What a great project. That should keep someone busy for a while. Thanks for posting it. How cool... Great future project for my kids. Nice lens! Now this looks like a fun project! Thanks for sharing, well done! You have a great web site! But I see a problem. I agree with your statement that the ratios between gears can be easily confused. It looks like you you may have been thinking of one revolution on the clock face covering a full day of 24 hours rather than a half of a day of 12 hours in the section called "What Do I Need My Gears To Do?" Every time the Second hand rotates a full revolution, the Minute hand needs to turn 1/60 of a revolution. 360/60 = 6 degrees, not 12. Every time the Minute Hand Turns a full revolution, the Hour hand turns 1/12 of a revolution. 360/12 = 30 degrees, not 60. What a superb informational lens! Love the step by step guide. It's a great lens. Very interesting and informative.I will use that method in the last video to teach my daughter how to tell the time. I have seen some antique wooden gears that were cleaned up and they are wonderful. Would look great as wall decorations. A very informative lens! Great job you've done here! Your lens is so interesting and you executed a detailed step by step guide. Great job! Thanks for sharing these tips on How to Make a Wooden Gear Clock. Very interesting. Popping back in with blessings for this really cool lens! Very interesting lens. I have to try to make it soon. Very nice and interesting lens. They are too difficult for me, I will finish for doing a disaster. But I strongly appreciate this art and your lens, so beautiful and illustrative. A wooden clock would be a woodworking masterpiece. Fascinating article. Thank you for publishing it. My father made such a clock when I was a kid. It was always fun to watch it. A really great lens, thanks. Such a cool lens, thanks so much! Wow for real? I wish. Watch and clockmakers have always blown me away at how patient you must be. Great lens! Very unique lens! Thanks for posting! Thanks to it, now i can make my own clock. What a cool lens. Thank you for sharing. I've loved this before and I'm pleased to return with angel dust and congratulations on your purple star and home page honors! Challenging thing to do but doable. This lens sparked my interest in creating useful gadgets. @anonymous: cool. 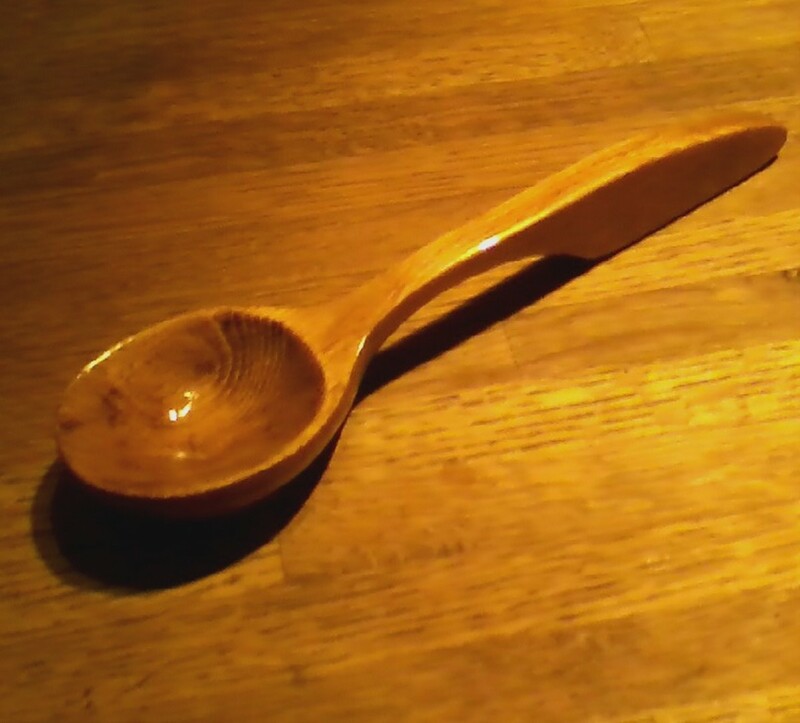 There is something about working with wood. 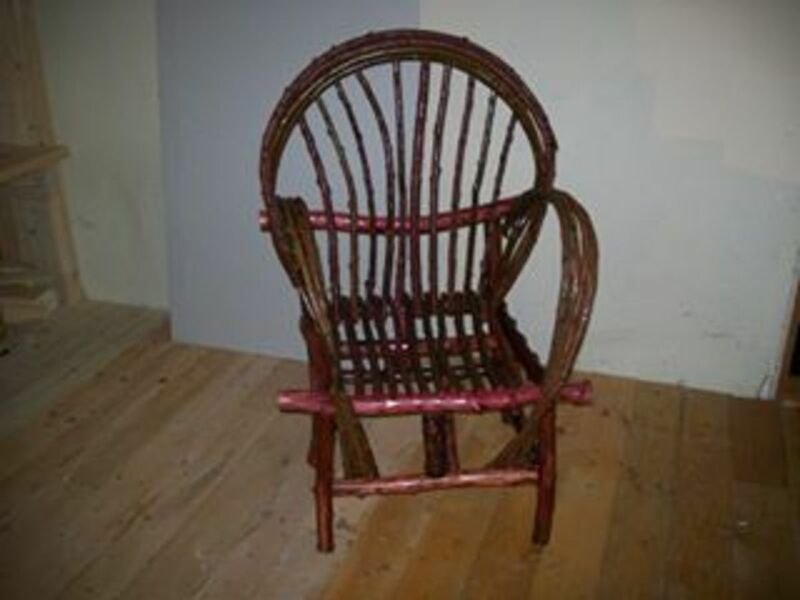 It is one of man's oldest crafts. You've made a really great lens. My husband did a wooden boat and he'll teach our son when he's old enough. Keep up the good work.